According to Wikipedia, “a pangram (Greek: παν γράμμα, pan gramma, “every letter”) or holoalphabetic sentence for a given alphabet is a sentence using every letter of the alphabet at least once. Pangrams have been used to display typefaces, test equipment, and develop skills in handwriting, calligraphy, and keyboarding. In English, the best known example: “The quick brown fox jumps over the lazy dog” contains all 26 letters – count them, you’ll see. And a quick google search will introduce you to the world of pangrams that you never knew existed – at least, that’s the way is is/was for me. I bet you are wondering: so how did I glomb onto a pangram anyway? Well, actually, it was quite by accident. After we three decided our plan for our “talking/sharing points” on the blog for the rest of the year, which is, in case we haven’t shared it: alphabet soup . Each week, we’ll select a letter and write about it and we decided that, like eating alphabet soup, we’d each choose whatever letter struck our fancy…so, the wheels started turning in my head and I started making notes, brainstorming blog post ideas for each letter, etc. Yesterday, August 20, I was reading this blog post (read down) and being intrigued, did a little exploration, i.e., the google search and decided that I’d do the letter P ! So, that’s how I got from there to here. Yesterday, I also decided to put together a new cart I’d purchased to house the many products I have for my myriad projects. Of course, to add a new piece of anything in my studio means that I also purge and re-organize – an ongoing, seemingly endless pastime in my life. 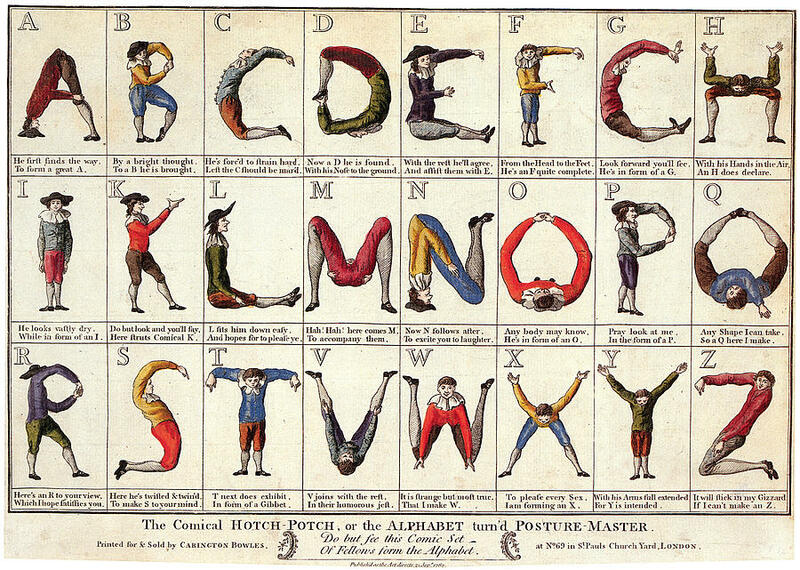 And in so doing, I found an alphabet puzzle (from Williamsburg) made from a copy of an alphabet print made by Carrington Bowles in 1782. Perfect, I thought. I turned the pieces over so the plain backside shows and each week, I’ll select a puzzle piece and proceed from there, except there are some weeks that I’ve already planned the post…but that’s probably OK since we have fewer than 26 weeks left in the year, which the alphabet in the 1700s had only twenty-four letters. 21 Aug	This entry was written by Honoré and published on August 21, 2012 at 1:12 pm. It’s filed under Creativity, Honoré. Bookmark the permalink. Follow any comments here with the RSS feed for this post. Pangrams…too much fun! Glomb…best word ever! What a fun print….missing letters…who knew? is glomb a word? i don’t know…guess i could look it up…thanks for your comments. honore…..what a fascinating human being you are. hi janis…and thanks so much for your comment. i hope all’s well with you and that someday we’ll meet. need to set that up with our gal Kathy.